Adam and Meghan Owenz started Starting Lines to engage kids and their parents in creative play. There is a new board game hitting the game-night market and it starts with just a line on a piece of paper. The game is called Starting Lines, and it goes like this: A category is selected, like "things people do for money," and a starting line is selected. Yeah, a literal line on a piece of paper. Every player has two minutes to change that line into a drawing with a caption — a curly-que becomes the snout of a dog, two parallel lines become the shape of a truck, circles become hot air balloons. A judge selects a favorite and that player gets a point. Get the most points, you win. Seems simple enough. But creators Adam and Meghan Owenz, of Wyomissing, Berks County, created the game to be more than just a laugh. It's actually good for your kids' brains. And yours, too. "Creativity is a muscle," said Adam, a marketing professor at Albright College. "Grow your own and give your kids a chance to flex theirs and maybe we'll start to see an increase in creativity." To play Starting Lines, all you need is three or more players. The game includes a two-minute timer, markers, categories and starting lines. The couple is also the creator of the website Screen-Free Parenting, a parenting blog that chronicles their choice not to introduce screens of any kind into their home while raising their two kids under the age of 10. A Kickstarter campaign for Starting Lines launched on Wednesday and by noon it had already hit more than $1,000 in its $20,000 goal to fund the first big production of the game. If they reach their goal, the couple will be able to fund 1,000 games and 500 extension packs that they predict will ship in February 2019. The game will sell on its website and on Amazon. If the whole exercise feels familiar, that's because it is. It feels a lot like a test that's been used to measure creativity since the 1960s. Created by E. Paul Torrance, it's called the "Incomplete Figure Test" and it's part of the Torrance Test of Creative Thinking. It asked kids to see what kind of drawings they could create with a sideways letter "V" as the jumping off point. Researchers have used the test to combat and determine what experts call the "creativity crisis." In 2011, a well-known study showed that after the sixth grade, creativity remained static or decreased in students and that since 1990 — even though our IQs have gone up — creative thinking scores have gone down. Meghan Owenz, a psychologist and professor of psychology at Penn State University Berks County campus, said the game intends to level the playing field; adults won't have to fake interest and kids won't have to struggle to understand the strategy. “Kids are naturally more creative than adults, so this is a game where adults can try their hardest and still be beat by a seven-year-old," she said. 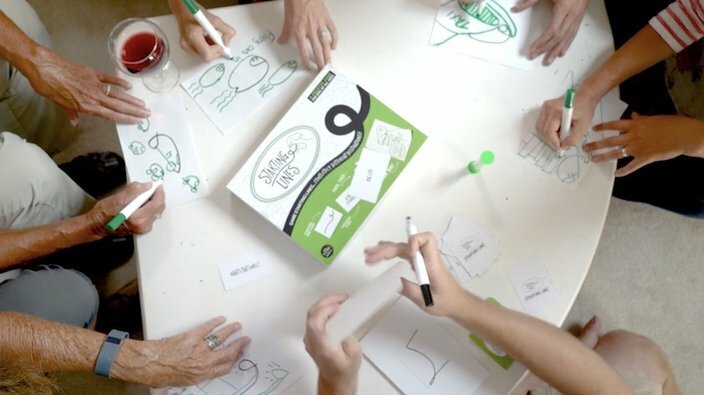 There's also an adult extension pack to the game, which will inspire some "immature creativity" during adult-only game nights, she said in a Kickstarter video. When you donate $20 or more to the fundraiser, you automatically pre-order your own Starting Lines game. And the couple is offering a buy-one, donate-one option, too. They'll donate Starting Lines to a school, library, boys and girls club, summer camp or after-school program for a bit less than the cost of two games. "We would love to see this to be a part of the movement towards recognizing the importance of creativity," Meghan said. You can learn more about Starting Lines and the "creativity crisis" here.